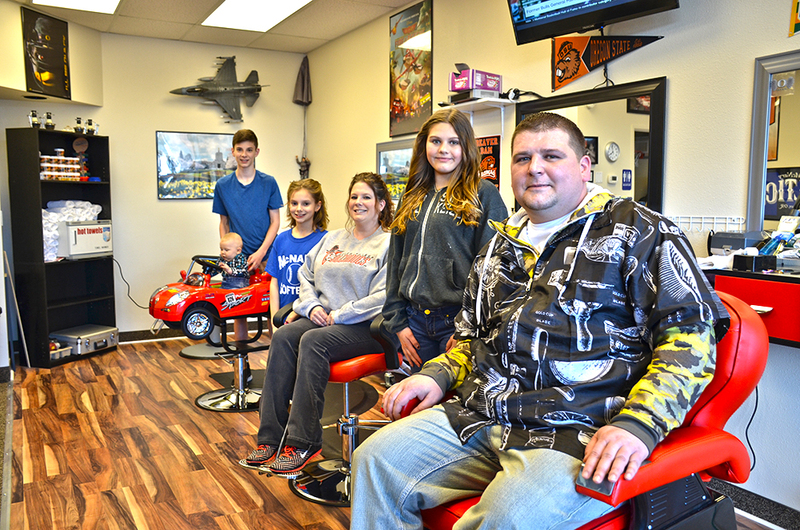 A local barber has opened up a new shop in Keizer. After eight years of working in another shop, Dave Wells has opened Dave’s Place at 148 Chemawa Road N.
Wells and his wife, Emily, recently purchased a home in town with their family – including Brennan Dobson, a baseball player for KYSA, Jasmine Wells, a volleyball player for Claggett Creek Middle School, Hazel Dobson, a softball player of Keizer Little League, and 6-month-old Chase Wells, official team mascot for whoever happens to be on the field or court at the moment – is laying down roots. For the time being, Dave’s Place is open seven days a week 9 a.m. to 6 p.m. There will probably be some adjustments after he discerns what the peak times are. Cuts are $17 and that includes children. Wells can also do straight-razor shaves. When designing his shop, Wells paid particular attention to the way young customers would feel once in the chair. Learning to drive can become a contentious ordeal for even the most patient teens and their parents. Former drag car racer Doug Herbert started out hoping to help teens improve their driving skills, but he’s ended up creating some better parent-teen relationships along the way. “Some of the kids come to BRAKES kicking and screaming, but at some point during the day the light bulb comes on and they realize everything they don’t know. Those same ones that come in kicking and screaming have their arms around their parents at the end,” Herbert said. 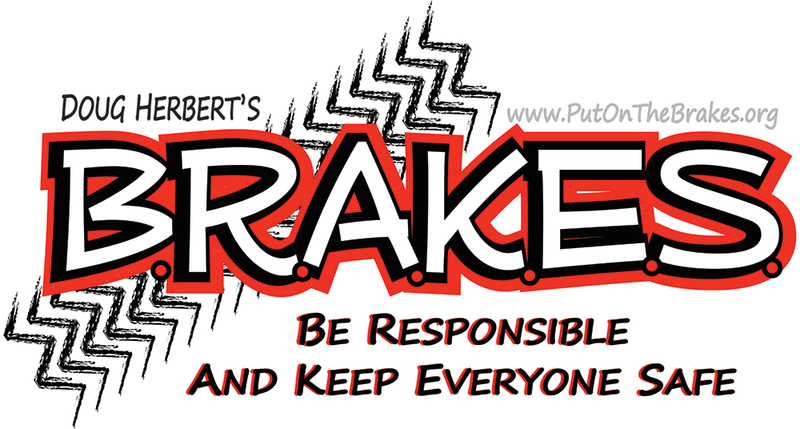 BRAKES is a non-profit organization Herbert founded in memorial to his sons. He and his crew will be coming to Keizer’s Volcano Stadium on April 1 and 2 to help teens dive deep into defensive driving skills. There will be four chances to participate, from 8 am. to noon and 1 to 5 p.m. each day. The course is free, but a $99 refundable deposit is required. Students must be age 15 to 19 with a valid permit or license and 30 hours of driving experience. At least one parent also needs to attend with the student. Registration can be completed at putonthebrakes.org. A University of North Carolina study of the program showed that BRAKES graduates are 64 percent less likely to be involved in a car crash within the first three years of driving. Herber never expected to become a driving instructor. His enthusiasm for driving fast found an outlet in the drag racing scene, but he always gave safety concerns their due. He was an early adopter of body harnesses and custom seats when they became available. Everything changed in 2008, when his sons Jon and James, 17 and 12, respectively, were killed in a crash less than a half mile from their home in North Carolina. “They’d hopped in the car to go to McDonalds and Jon was driving too fast,” Herbert said. The following week, the local school closed for his sons’ funerals and Herbert went and talked with students about not only what he was going through as a parent, but what the students needed to do to be safe on the road. “That’s when I realized I knew a lot about driving fast, but I also knew a lot about driving safe. It was as much therapy for me as it was for them,” Herbert said. Not long after, Herbert founded BRAKES and enlisted a slew of highly-trained drivers to help in the effort. “Most of them have their own BRAKES story and a reason for why they teach. It’s not like the local coach who also teaches driving,” Herbert said. The BRAKES course begins in a mobile classroom, but soon both parents and their student drivers are taken to separate parts of the parking lot to take turns behind the wheel in a variety of high-risk scenarios like crash avoidance, emergency lane changes, steering with anti-lock brakes engaged, skid avoidance and recovery and what to do if a wheel drops off the road. The end result is an experience that leaves an impact far beyond imparting defensive driving skills. “I think everyone leaves with more appreciation for the fragility of life and knowing they need to pay more attention to those they love as well as the road,” Herbert said. The BRAKES courses are being sponsored by Power Kia and the Salem-Keizer Volcanoes. The Keizer Planning Commission opted to continue a public hearing on a proposed Safeway fueling center on River Road North at its meeting Wednesday, March 15. Representatives of Safeway requested a continuation of the process while they determined how to deal with a prohibition on sales of other merchandise in a proposed amendment to the city’s development code. But commissioners also wanted to hear more on other issues brought up during a public hearing. Concerns about traffic, especially in regard to the Keizer Fire District’s ingress and egress, were at the forefront for the commission (see sidebar below). Continuing the public hearing delays the commissioners’ decision regarding whether the fueling center should be permitted. The Keizer City Council, however, will have the final say on the matter. In most other areas along River Road, a gas station would be a permitted use. But, even before Keizer had a development code, the then-city councilors decided to put an “overlay” zone in the area between Claggett and James streets on River Road North and Elizabeth Street and Bailey Road on Chemawa Road. The overlay still prohibits several types of development (see sidebar, below) and one of them is a fuel station. Safeway needs the restriction to be modified for the fueling center to move forward. 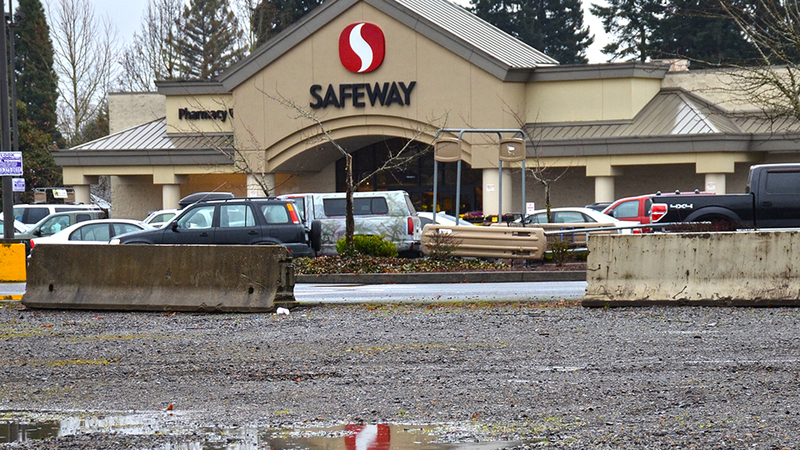 The fuel center would be placed on an undeveloped spot in the Safeway parking lot. Commissioners were given four options for a decision: doing nothing and keeping the restrictions in place; eliminating the restrictions entirely; backing a text amendment proposed by Safeway that wouldn’t allow the city to place conditions on traffic mitigation and other issues; or allowing the fueling station as a conditional use so long as Safeway committed to other improvements and traffic mitigation efforts. Seth King, a land use attorney, spoke on behalf of Safeway saying that the staff-proposed amendment to the zone was largely acceptable except for a prohibition on sales of other merchandise. If approved, fueling center plans call for a convenience stand where items like soda, coffee, cigarettes and other convenience fare would be sold. “This is not a workable business model. It wouldn’t be a full-service convenience store, but some ancillary sales are expected and a necessary part of these fueling stations,” King said. King said Safeway would either like to have the prohibition on such sales removed or have the hearing continued at a later date. Safeway had looked into building a gas station on the site as early as 2013, but the plan never moved forward internally, said Chris Miles, a construction project manager for Albertsons, the company that acquired Safeway in 2014. Miles said the additional merchandise sales were an essential part of the package. “That sale doesn’t do much for us overall, but if we don’t offer it, we lose the fuel sale,” Miles said. A main point of contention in the conceptual plans is an increase in traffic to the shopping center that would result from adding a gas station. Keizer Fire District Chief Jeff Cowan said the district would not support a change to the overlay zone. “Don’t change it. It’s there for a reason,” Cowan said. “We have to go into oncoming traffic to reach River Road or the other side of Chemawa every day,” Cowan said. Miles walked commissioners through some of the changes Safeway is proposing to help alleviate clogs on Chemawa if a fuel center gains approval. The main entrance would be widened by 12 feet to allow for easier flow into the parking lot, especially for those turning left from westbound lanes. However, the draft plans also included a reworking of the parking lot near the main entrance. At least three of the parking spaces on both sides of the first aisle of parking spaces would be removed and some handicapped parking added to force customers further into the lot rather than allowing them to wait for the closest parking spaces to open up and creating congestion on Chemawa. “I don’t think we addressed the fire district, but we addressed the flow,” Miles said. Chris Brehmer, an engineer with Portland’s Kittleson & Associates, said additional mitigation might be possible with some linking of the signals on River Road North. “The development will increase traffic and we are trying to understand what they will be, but this is a chance to improve the entrance issues,” Brehmer said. Commissioners didn’t show much of their hand with their questions on the proposed changes, but said they wanted to get more input from the other entities that might be impacted like the Keizer Fire District and Salem-Keizer Transit District. “This is a big investor in our community and I don’t want to slow them down, but if we are going to continue this, I want the other interested parties to be here,” said Commissioner Garry Whelan. If politics makes for strange bedfellows, the same might be said for business. While the Keizer Planning Commission was taking testimony on a proposed fueling center at Safeway on River Road North, the proposed removal of an overlay zone drew support from a connected pair of individuals. They supported the Safeway proposal, but had other vested interests in having the overlay zone removed. While Safeway wants a prohibition on gas stations in area between Claggett and James streets on River Road North and Elizabeth Street and Bailey Road on Chemawa Road lifted, the same part of the development code also prohibits auto dealers, auto rental and auto repair businesses, recreational vehicle parks, public utility structures and building and drive-thru windows associated with eating and drinking establishments. That last provision is what brought out Adam Wittenberg and Coldwell Bank Commercial realtor Pam Rushing. Wittenberg recently acquired the old Bank of the Cascades building at 5120 River Road N. and has had some interest from a restaurant looking to locate there. The drive-thru prohibition stands in the way. Wittenberg did not say who was interested in the site, but said “great businesses like Burgerville, Chick-Fil-A and Del Taco” aren’t looking at Keizer, and implied that the drive-thru window prohibition is snarling the deal for a potential tenant at the Bank of the Cascades location. He said he fields multiple offers each week to set up a marijuana dispensary, but it sits within 1,000 feet of McNary High School. Rushing said that it is getting easier to attract businesses to River Road, but that prohibitions like the ones set forth in this specific section of the development code make it difficult. While there is a prohibition on new food drive-thrus, old ones – like the ones at the old Roth’s location – are grandfathered in. Because those windows are now inactive, the property owner was able to shift them to the new building that will be home to The Human Bean, a coffee company. When Starbucks reps selected its new site south of Chemawa Road, they chose the first property in the immediate vicinity not included in the drive-thru prohibition zone.